This incredible loop takes you from forested canyons to breathtaking alpine with expansive views and beautiful lakes. Although the trail can be hiked in either direction, this description takes the counterclockwise approach by beginning in Paintbrush Canyon and coming out through Cascade Canyon. 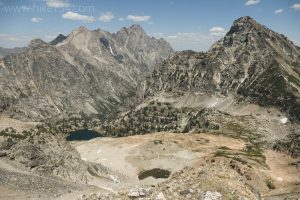 The trail crosses the outlet of String Lake, wraps around the lake and heads up Paintbrush Canyon to Holly Lake (see Holly Lake for description). The steepest part of the hike is from Holly Lake as the trail climbs up a ridge to join the Paintbrush Canyon trail again. From the junction, it steadily works its way up towards the divide, passing through the incredible, alpine scenery as more mountains become visible. The footing gets loose as you approach the final switchbacks to the divide. The unforgettable, sweeping views in all directions are worth the effort and more mountains come into view as the trail traverses the ridgeline. At the divide, you look east back down Paintbrush Canyon and north to parts of Leigh Canyon and Mt. Moran. To the west, the Jedediah Smith Wilderness stretches out and the Teton Range dominates the view looking south. The trail continues along the ridgeline through meadows of low-growing, alpine plants, then begins to descend into Cascade Canyon. Lake Solitude quickly comes into view. Tucked up high above Lake Solitude is the mint-green Micah Lake fed by Petersen Glacier. The trail descends through vast boulder fields that slowly give way to more wildflowers and vegetation. The descent provides great views into the glacier carved, U-shaped canyon backdropped by staggering peaks; most prominent being the Grand Teton. The trail eventually reaches the shores of the lovely Lake Solitude, which provides a beautiful spot to stop before descending through Cascade Canyon. The trail is a nice steady grade that alternates between open boulder fields then shaded stands of trees. The trail crosses numerous flower-lined feeder streams, as well as Cascade Creek a couple of times as you enter the forest. The trail converges with the South Fork Cascade Trail to become the Cascade Canyon Trail. The trail emerges from the forest and follows the creek down through the canyon. The craggy peaks tower above as you work your way through the boulder fields that are home to pikas. Tall willows line sections of the creek and are popular with moose. As you get close to exiting the canyon, the trail briefly comes alongside Cascade Creek which begins to actively cascade before Hidden Falls. 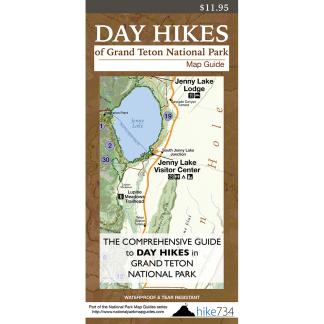 Take a left onto the steep Horse Trail at the junction, bypassing the falls, to the Jenny Lake Loop Trail. Follow it along the northwest shoreline of the lake. Initially most of the views are obscured by trees, however there are sections that break open to some nice overlooks of the lake. The trail reaches the inlet of the lake where you follow along the creek and cross the bridge to where you began. Trailhead: Turn onto the road heading northwest at the North Jenny Lake Junction and turn right into the String Lake area. Park at the String Lake parking lot. If the parking lot is full, head up to the Leigh Lake parking lot and take the scenic trail along String Lake south for an additional 1.0mi/1.6km round trip.